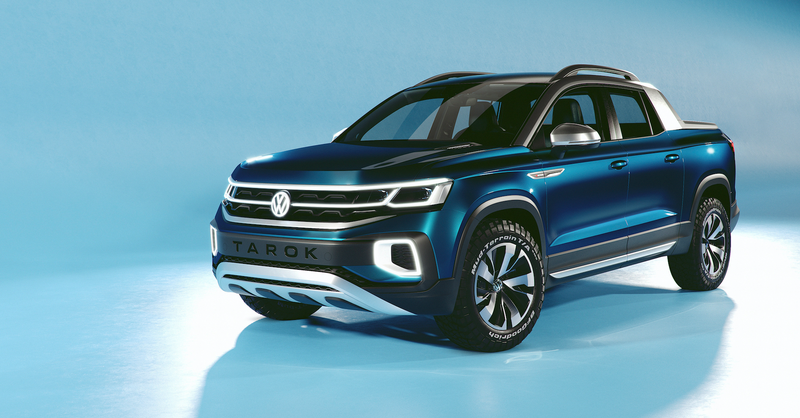 Volkswagen will be bringing their South American market-bound Tarok compact pickup truck to show everyone in New York, and the concept looks to be a pretty clever little pickup truck with some interesting bed and cab design features. The plan is to build it in Brazil for VW’s big customer bases in Brazil and Argentina and other South American countries, but the whole point of showing it in America is to gauge reactions of Americans to a pickup that isn’t absurdly huge. I personally think there’s a demand for that, but I guess we’ll see? Oh, and even though the name sounds like it could be Spock’s half-brother who has been following whatever the Vulcan equivalent of Phish is for the past year or so, it actually seems to be a reference to the Tarok people of Nigeria. The truck is built on the same MQB platform that VW uses for everything from the Golf to the Atlas, so we’re talking a unibody truck here, not a body-on-frame one. It’ll be one of VW’s largest MQB-based vehicles yet, but still relatively compact for the modern truck market, at least in the U.S.
It’s a double-cab truck, and while that means a stunted bed length, Volkswagen’s designers have done some interesting things here, where they’ve provided a flip-down door in the rear of the cab that, when coupled with the rear seat folding down, effectively makes a longer cargo bed. It’s a great idea that adds a lot of flexibility to the truck, though, to be fair, VW didn’t come up with the idea. We’ve seen it before, perhaps most bonkers-ly in the Toyota BB Open Deck, the Japanese-market variant of the Scion xB. The truck can carry 2,271 pounds, which is pretty decent, especially when you consider that there are some Ford F-150 versions that are rated for much less than that. The design of the truck fits well within VW’s current design language, with the wide, horizontal grille slats that continue to outline the headlamps, though I’m not expecting the illuminated grille bars or badge to make it to production. Otherwise, this concept seems very production-ready. I hope there is some interest at the New York show for the truck; I think there’s some untapped demand in America for a reasonably-priced, non-colossal truck that can actually do decent work. Volkswagen once had a player in this space, a long time ago, and it was even built right here in America. I think its time has come again. I guess we’ll have to see what all those cranky New Yorkers think.